Fantastic recipe for homemade banana breakfast smoothie. The combination of this delicious fruits is incredible because it is just so deliciously smooth, rich and creamy. And still it is so wonderfully light and it is so fast for preparation. Blueberries are a fantastic choice as one of your five portions of fruit and vegetables a day. The leader of the superfood trend, this cute little North American fruit packs a powerful nutritional punch. Valued for its powerful composition , some nutritionists believe that if you make only one change to your diet, it should be to add blueberries.They are regarded as superfoods mainly because of the abundance of antioxidants. Blueberry extracts (such as anthocyanins) have been shown to decrease free radical damage that can cause cancer. They boost memory and concentration and greatly improve heart health. Rich in fiber and low in calories, they are an ideal choice for slim figure and healthy weight management. Bananas are rich in fiber and high in vitamins and minerals to give all the essential nutrients for your body. A banana’s combination of complex carbohydrates, natural sugar, amino acids and brain-boosting minerals make it a beneficial food for athletes and fitness enthusiasts. Bananas have a low glycemic index, which also helps in weight loss. Eating bananas helps in controlling increased blood sugar levels in the body. Chia seeds are another superfood for obtaining perfect health. Chia is filled with two times more protein than most grains and five times more calcium than milk. Plus, it has high levels of omega-3 and omega-6 fatty acids, soluble fiber, potassium and antioxidants. These precious seeds reduce food cravings and prevent some of the food that you eat from getting absorbed into your system. This blockage of calorie absorption makes them a great diet helper. Wash the blueberries under cold water, pit the dates, peel and cut the banana in pieces and place all the fruits into the blender. Add all the other ingredients in the blender and blend until the mixture is smooth. 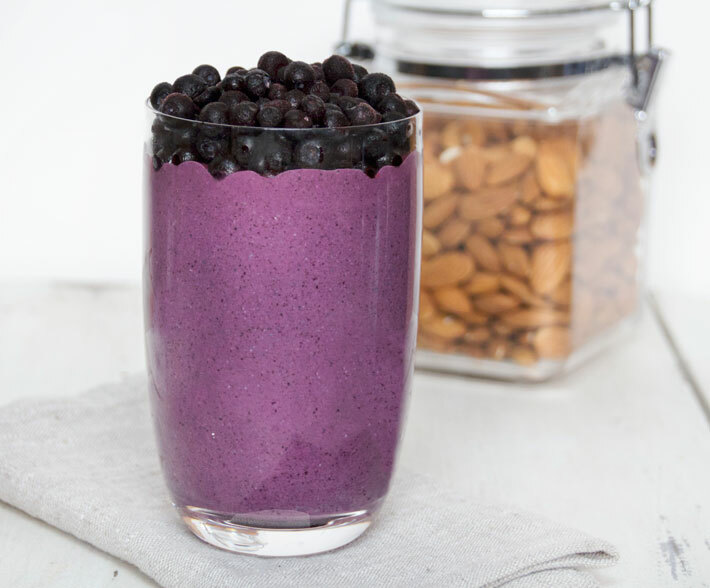 Serve the smoothie in a high glass and add a few blueberries on the top.